On the blog earlier this week we talked about the latest research to identify the people who are most at risk of dementia. Our age and our genes are two of the biggest risk factors for dementia and, no matter how hard we try, there’s nothing we can do to change who our parents are or when we were born. While these elements of risk might be set in stone, at the Alzheimer’s Association International Conference this week we’ve heard from researchers who are targeting elements of lifestyle that may alter our dementia risk, so called ‘modifiable risk factors’. Apps and puzzles that are mentally challenging can be fun, addictive and frustrating in equal measure. Maths puzzles may well improve your mental arithmetic, and you’ll get better at crosswords or Sudoku the more you do them but can these improvements really translate into a general benefit in terms of memory and thinking ability or even alter the risk of dementia? The evidence in this area is patchy. Previous research has shown that staying mentally active and socially engaged seems to be linked to a lower risk of dementia but it has been much less clear whether specific ‘brain training’ programs have any beneficial effect on risk. On Monday we heard some of the promise as well as some of the challenges in this debated area of research. One interesting presentation came from researchers in Florida who presented findings indicating that a kind of cognitive training designed to improve the speed and accuracy of visual information processing was linked to reduced rates of dementia. In the ten years following this kind of training 12.1% of people went on to develop dementia compared to 14% of people who didn’t take part in any training. Exercise – Worth the sweat? One of the groups of people most at risk of developing dementia are those with mild cognitive impairment (MCI). People with mild cognitive impairment have memory and thinking problems that may be starting to interfere with day-to-day life but aren’t severe enough to be categorised as dementia. Not everyone with MCI goes on to develop dementia but people are at a higher risk of dementia than others of the same age who don’t have MCI. Dr Laura Baker from Wake Forest University, addressed the conference with evidence that exercise could be beneficial for boosting brain health in people with MCI. 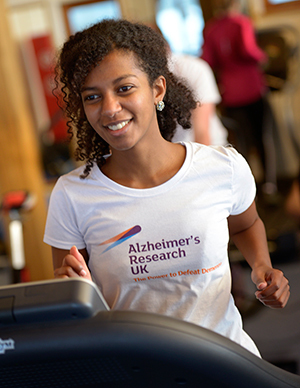 She showed how a 12-week programme of intense aerobic exercise was linked to reduced biological indicators of Alzheimer’s disease and improvements on certain tests of memory and thinking. There is already good evidence that staying physically active in mid-life can help maintain a healthy brain, but this study highlights the point that it’s never too late to reduce your risk. Risk reduction is an active area of research and, as with any new scientific findings, we need to treat initial findings cautiously until results can be reliably reproduced by other groups of researchers. One of the challenges in researching these training programmes is defining exactly what the training is. Terms like ‘cognitive training’ or ‘aerobic exercise’ can refer to a range of different activities and researchers at the conference were clear for the need for a detailed description of what participants are doing in a particular programme so a study can be accurately repeated by other teams across the world. It is also difficult to make sure participants follow the training programme in this kind of research. It is much harder to ensure a person completes a 45 minute training programme every day than it is to ensure someone takes a daily pill as part of a clinical trial. “Prevention is better than cure”- a saying applied to all areas of life in which stopping something undesirable is easier than dealing with its consequences. For Alzheimer’s disease there is no cure. And while researchers are driving progress towards more effective treatments, there is good evidence indicating that there are things we can all be doing right now to reduce our risk of dementia. These may not work for everyone, and no single thing will prevent dementia altogether, but it’s something we should all be thinking about. Specific programmes to reduce dementia risk still need to be tested in large scale clinical trials before we can tell if they’re any more beneficial than simply leading a healthy life. Integrating approaches that involve the both body and the brain may ultimately yield the most benefits in risk reduction and research into programmes like this are promising.